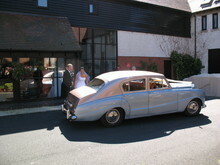 The 1947 Sheerline became Austin's first post-war, all-new model and carried on the established Austin tradition of offering a large saloon/limousine. 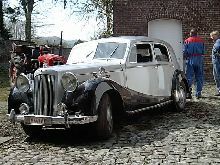 The Sheerline was originally called the Austin A110 Sheerline but after only 12 cars had built the car was renamed the Austin A125 Sheerline. 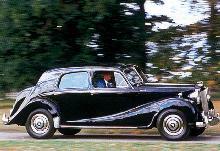 Produced at Longbridge the A125 came as either a 4 door saloon or as a Limousine, both cars featured "Razor Edge" styling by Austin's own design team. Both variants had a distinguished look with a large upright radiator, Lucas P100 headlamps and well appointed interiors, the cars were intended to be alternatives for the Bentley, Daimler and Armstrong Siddley customers to consider. 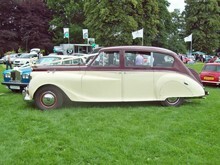 Austin also offered a A135 Princess version of the Sheerline, this particular model was styled and built by coachbuilder Vanden Plas. 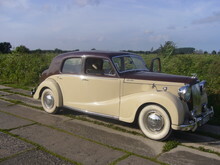 For some reason these large Austin's failed to capture the publics imagination and most cars were purchased by hire companies or for civic ceremonial duties, a few were also built with Ambulance bodies for private hospitals. 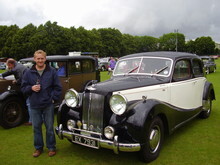 Buyers Guide Austin Sheerline and Princess featured in Practical Classics June 2009 – available from our sister site Bookbase. Click here to view.